ICON Baggio, Seedorf, Cannavaro, Makélélé, Raúl, Rivaldo, Cruyff, Eusébio, Gerrard & Lampard are confirmed on FUT19 ! do we expect more new icons or is that it? Ah, the card I wanted. Amazing! Don’t even care if it’s rubbish! Praying for Totti! Playing FIFA 18 without a Totti card was just strange. Will be disappointed if more of the removed ones are back in (Gattuso, Cannavaro etc) than new ones. Not saying I don't miss Figo and Zola, but I would love just tons of new ones. I hate to say it, but if King Kenny and John Barnes are icons, well "insert Bender take my money now gif here"
Where's my Zico, I know you're in game buddy as I've played with you!!!! I really like the design except that fut19 behind. What have you done EA? If thierry henry wont be in fut 19 i will lose my mind !!! Ea you better have him in the game..
makelele deserves higher defending and passing. - All the FUT18 Icons are present on FUT19. - Same system as FUT18, three different cards for each icons. 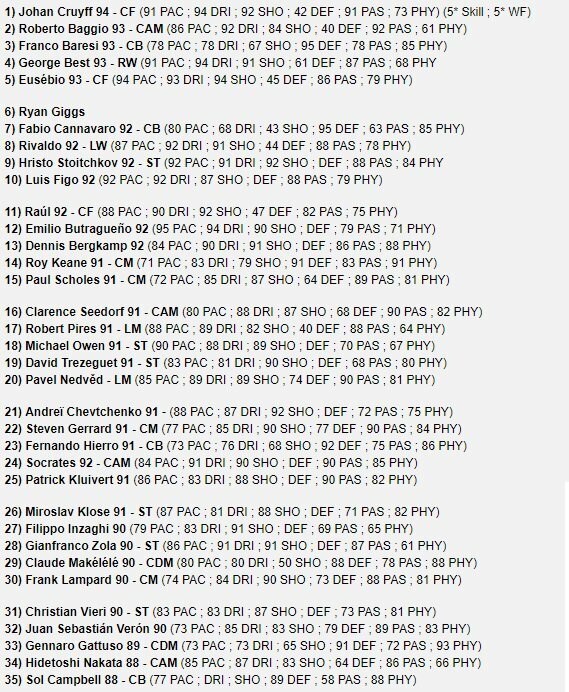 - The list of new icons FUT19 in their "Prime version"
Scholes better have better than 89 passing this time.